Sunderland’s Pop Recs Ltd are set to provide an opportunity to witness the genesis of one of the city’s most important music communities with an exhibition which celebrates 35 years of The Bunker, which will run at the venue until November. For the uninitiated, The Bunker began life as a music venue which played host to a slew of anarchic punk gigs in the early 80s, run by a group which styled itself as the Sunderland Musicians’ Collective. After playing host to major names like Joe Strummer, the venue closed down in the late 80s. However, the Bunker continued to remain at the centre of an independent community spirit in Sunderland and, in its current guise, offers rehearsal and recording space as well as courses, advice and development for musicians. 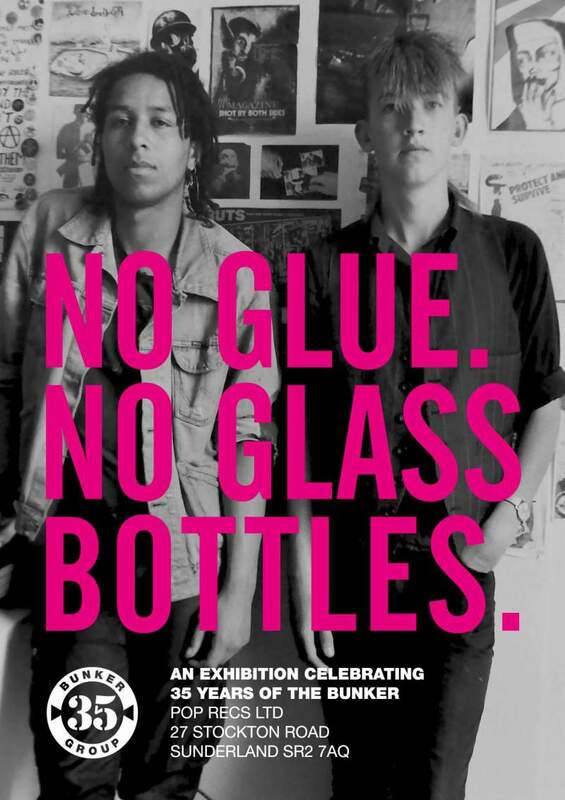 The exhibition – entitled No Glue, No Glass Bottles, which was the slogan that appeared on the collective’s gig posters – at Pop Recs (which is part of the Bunker space itself) highlights the Sunderland Musicians’ Collective’s influence on the music scene in the city, featuring a selection of over 70 photographs from riotous gigs as well as fanzines, posters, artwork, tickets and more.